← I love you all. Now go away. This entry was posted in Druid, Dungeons, Real Life. Bookmark the permalink. 2 Responses to What am I doing if I’m not blogging? *squee*! You’re back! I’m glad to hear about all your fun adventures, both in-game and out. I like the purple kitty, too. 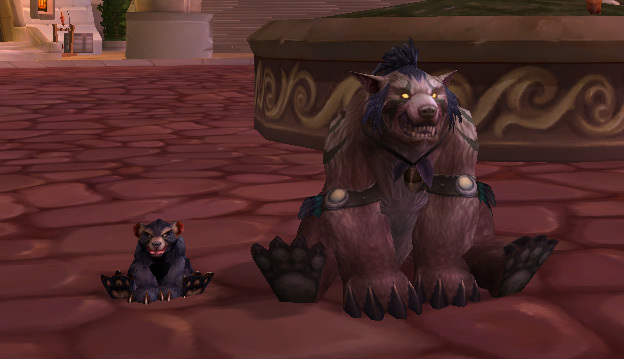 It’s my second-favorite NElf Druid color after the black, which is my favorite because the bear version has white stripes and thus looks a little like a badger. And you’re sort of a purple bear… just a really dark, dusky, brownish sort of purple bear.